Had a very weird problem with Firefox on my Windows 7 box. (It might also happen on Ubuntu desktop.) I switched the connection on my second, extended desktop monitor to use DVI instead of VGA. Suddenly, all the Firefox drop-down menus went blank. They would flicker briefly and I could see the contents, but then they would go blank. For example, when typing in a URL in the Firefox wonderbar, I get a code completion drop down list with all matching URLs and locations I’ve recently visited. The drop down list is there and appears for a split fraction of second, but then it goes blank and I can’t see it. It’s just a big blank rectangle. Oddly, I can select items from it and they appear in the wonderbar, but I don’t see them until I select them and all remaining items remain blank. The same thing happens for the search box, some Firefox menus, etc. Thanks a lot! Solved the problem. Thanks for the post; this helped. Worked like a charm…was driving me crazy…thx! 2: Drag Firefox in the extended monitor. 5: Start Firefox. It will open in the extended monitor and will correctly work in both monitor. NB: Windows7 64, firefox 6 and 8.01, Lenovo x200 laptop with latest drivers. Thanks a mill! It was driving me nuts too. Thanks for posting this. I had the same problem and I thought it may be my video card but I’m glad it was a Firefox issue. Thanks a lot, this problem was getting really annoying! Brilliant…had also been driving me nuts. Thanks for the post. 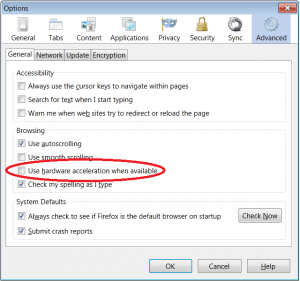 I solved it by unchecking the box marked “Use hardware acceleration when available” (as explained in the first post). 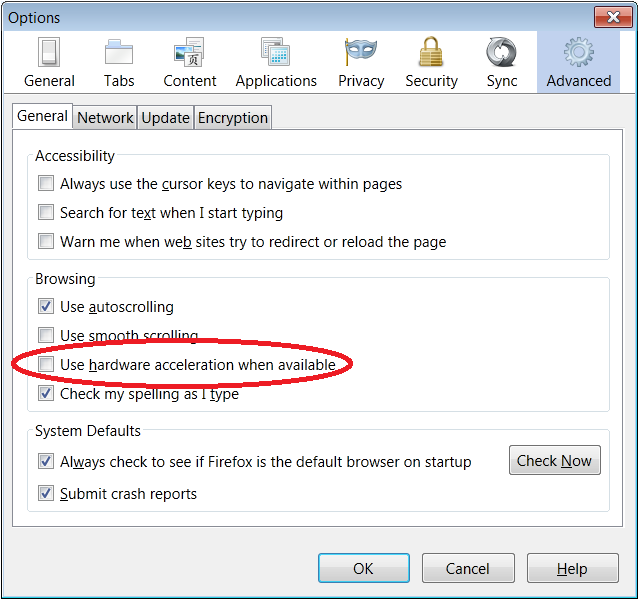 Then I returned in Firefox Options and checked the box again : it was still working fine after that, so you can keep the hardware acceleration. Thank you!!! This has been driving me nuts. thanks sooooo much! you are my hero. this was driving me crayz!!! Confirming that this solution works on Win7, FF 10.0.2, as of Feb 29 2012. However, @Kastor Lieberung’s solution did not work for me; the behavior changed and was _better_ than it had been, but still a problem with inconsistent and flickering dropdowns (specifically when a dropdown contained a side-menu, as in a folder in the bookmarks dropdown). I’m leaving the option unchecked. I have been battling this for ages. Thanks mate! thank you, this fix worked like a charm. Thank you so much… this was bugging me for months… and voila. You are my hero! Thank you for creating this page! Thanks so much for this solution to a very *annoying* problem! Thank you. This was driving me crazy. You pretty much just saved my computer from being dropped kicked out the window! YAY!! I’ve been pulling my hair out trying to figure out what has been causing this. It has affected firefox versions all the way back to Version 8. Thank You SOOO much! The OPs solutions as well as the n’s solution seem to work …. Thanks so much, that flickering was driving me CRAZY!!!! ha ha, but seriously, it worked like a charm, Thanks! Thank you so much for that information and your work to find a solution for that … prob! Thanks!! it was rather irritating! !